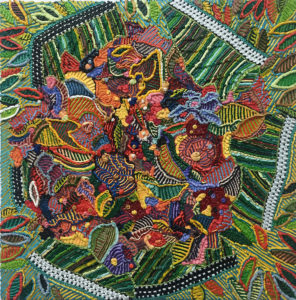 Caroline Larsen creates oil paintings that merge pixelated neo-impressionism with the idea of textile weaving. 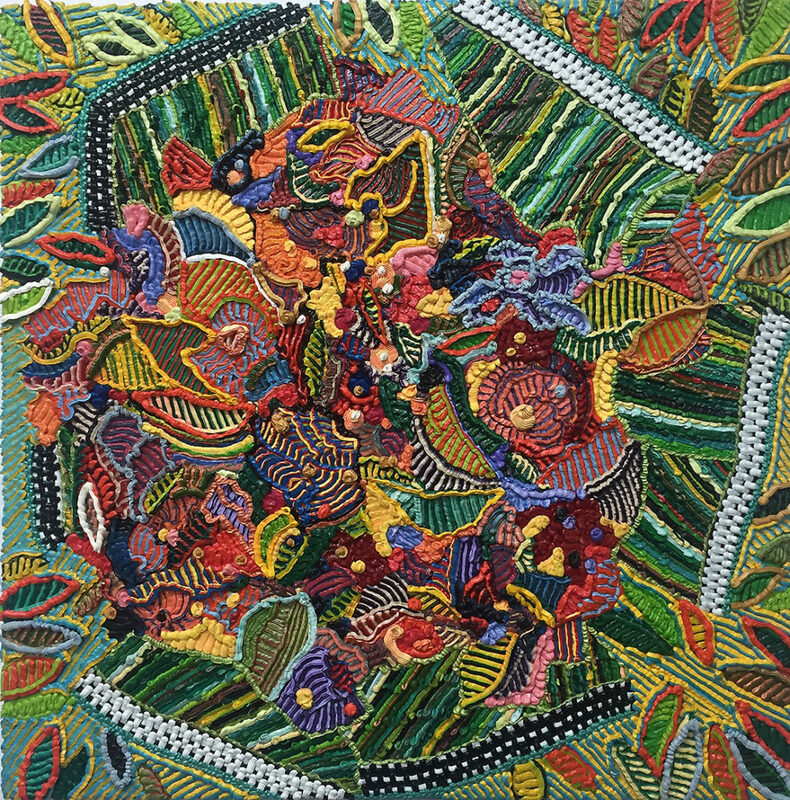 At first glance, her work may resemble fine needlepoint, but it is actually made up of tiny gobs and threads of oil paint on a canvas. Ribbons of paint weave up and over themselves to create paintings that are beautifully simple and concurrently complex. By employing blocks of colour mixed with luminous gradation, the paint underpins the canvas in an intricate weave. Rich, bright and intense colours demand the attention of the viewer, drawing them into the optical illusion of the painted knit. The Brooklyn-based artist received a BFA from the University of Waterloo prior to completing a Graduate Diploma in Visual Art and Art History Education from the University of Auckland, in New Zealand. In 2015, she graduated with an MFA from the Pratt Institute in New York, where she received a scholarship and an Outstanding Merit Award. She has exhibited across Canada and, more recently, was featured in shows in Toronto, New York, Los Angeles and Tel Aviv. 2018 was a busy year for Larsen, as she had solo exhibitions in New York City, Chicago, and Toronto, and held a residency position in Mykonos, Greece. Her work can be found in many national and international private collections, including TD Canada Trust and the Collart Collection. Larsen was a finalist in the 2015 RBC Painting Competition. She is represented by General Hardware Contemporary in Toronto.